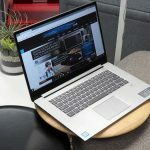 In this review I will review the latest HP model.Specter x360 13 (2017), equipped with a 13.3-inch Full HD display (1920 × 1080 with 166 PPI), Core i7-8550U processor, 8 GB of RAM and a solid-state drive (SSD) 256 GB. 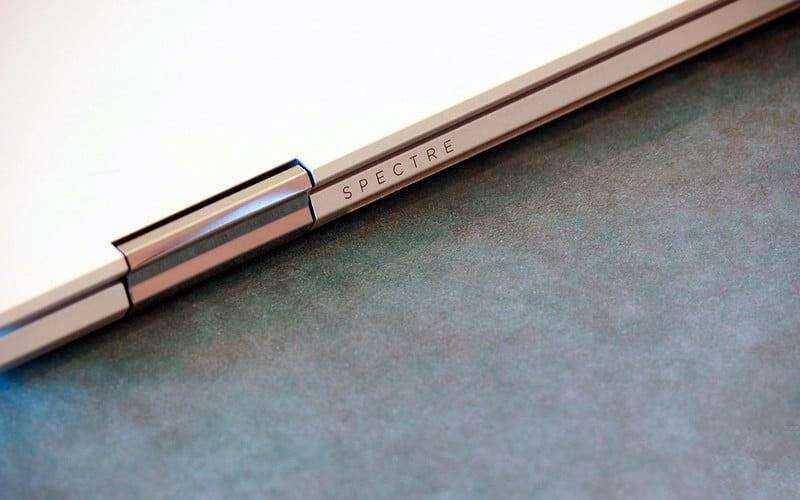 Its price is $ 1250 (70 000 p.), including the stylus (active pen) and the Natural Silver color scheme. In the maximum configuration Specter x360 13 costs $ 1820 ($ 101,000) with the same Core i7-8550U processor, 16 GB of RAM, 1 TB SSD, 4k UHD display (3840 × 2160 and 331 PPI) and in two additional colors - Pale Rose Gold or Dark Ash Silver. The HP Specter x360 13 (2017) has a slim and beautiful design. HP Specter x360 13 (2017) has not changed much in design: the thickness decreased to 1.37 cm, and the weight from 1.3 to 1.25 kg. The side frames of the screen were narrowed down to several millimeters. The new design makes Specter x360 a little overthinner than the 13.3-inch Lenovo Yoga 720 (1.52 cm and 1.32 kg). The case of the new x360 is quite durable and does not creak, but the lid and lower part bend at the slightest pressure. The rear edges of this notebook have hard-beveled edges, compared with rounded off from the previous model, and the hinge is more dense. This is felt when turning the display from one position to another. Keyboard HP Specter x360 13 (2017) inherited fromprevious model, retaining excellent keystrokes. The Yoga 920 and 720 have similar keyboards, but they are less tangible and accurate than on x360 13 from HP. The keyboard here has a uniform backlight, but it has no brightness settings. 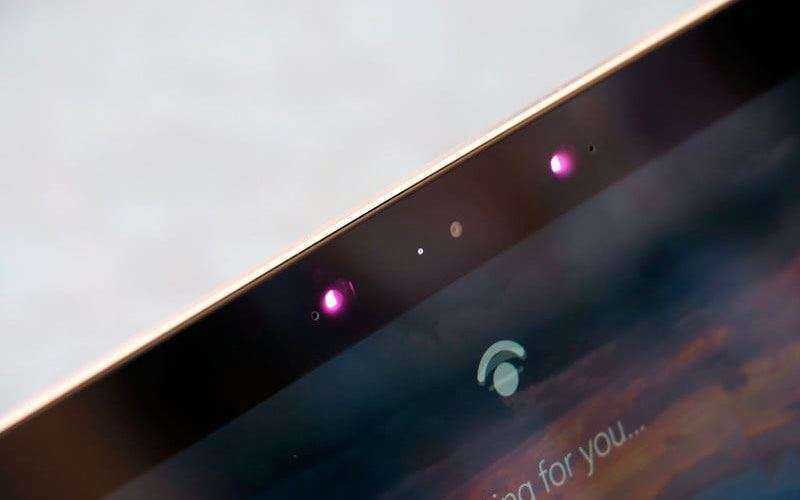 The Specter x360 13 (2017) touchpad is stilluses outdated Synaptic drivers, and does not comply with the Microsoft Precision Touchpad protocol. But the stylus was added a number of new functions: a custom button, an eraser and a gyroscope, which allows it to function as a “laser pointer” for presentations. The stylus of this x360 13 has its own battery and can be charged through the USB Type-C port, which is under the eraser. It is great for user interface navigation and notes. Infrared cameras and face recognition functionhere were also transferred from the previous model. 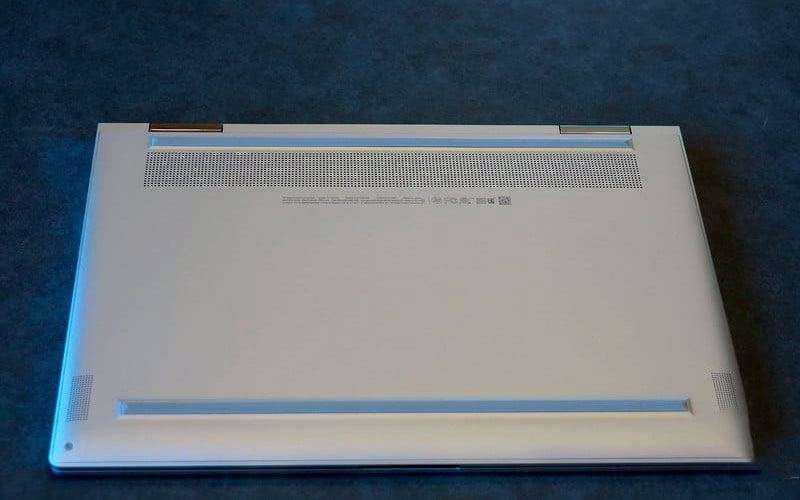 HP has added a fingerprint scanner, which is located on the right side of the case. Both unlock methods work quickly and accurately. The new Specter x360 13 2017 is equipped with13.3-inch Full HD display. 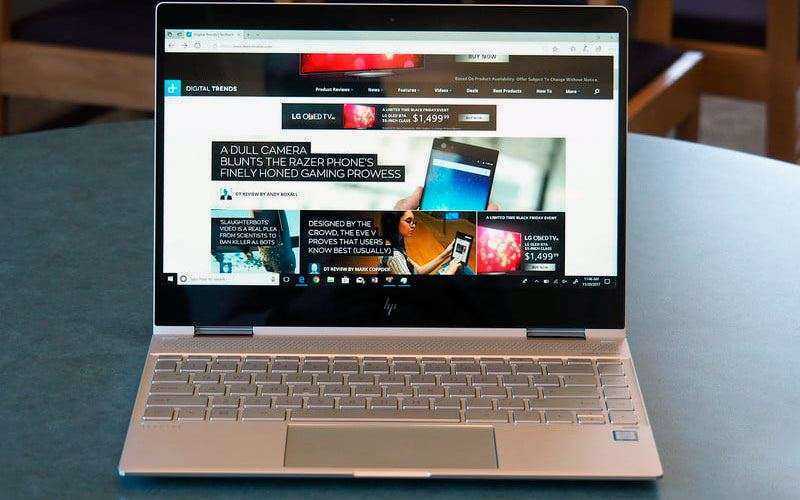 You can also choose a model with a full-screen display and the HP Sure View privacy feature, which was first introduced in the EliteBook x360 G2. The screen brightness is good - 301 nits, and the contrast -770: 1. But on the Full HD display of the previous generation, we managed to achieve a stronger contrast ratio of 910: 1 compared to the 880: 1 of the Yoga 920 and 600: 1 of the Yoga 720. The color gamut here is average: 71% AdobeRGB and 94% sRGB, with an accuracy of 2.91 (less than 1.0 is considered excellent). Again, the previous generation shows the best results. 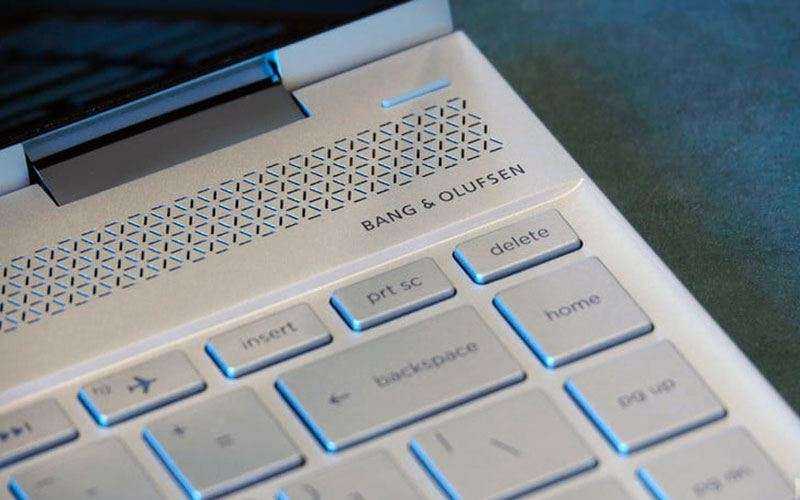 Bang & Olufsen speaker located abovekeyboard is nominal for the top level model. Its sound is above average, but quite loud and easily fills a small room. I used the app from bang & olufsen toturn on the bass, but the sound of the HP Specter x360 13 (2017) is almost unchanged. The music here sounds with a decent middle and high level, but with a weak bass. 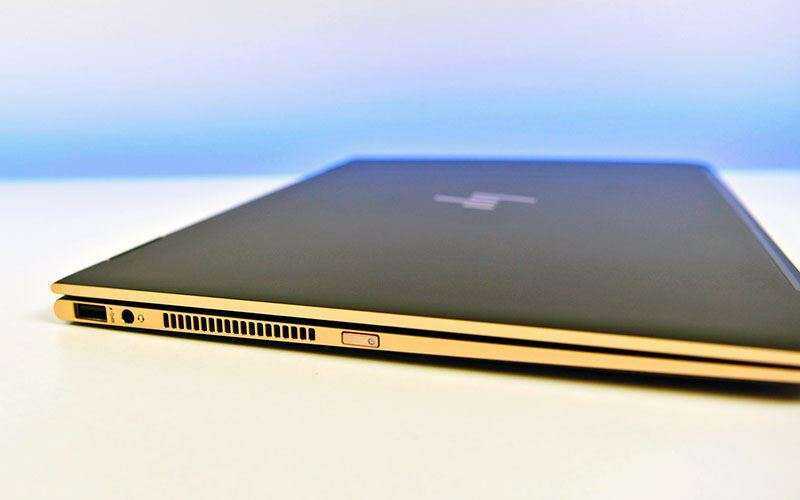 The HP Specter x360 13 (2017) has one portUSB-A 3.1 and two USB Type-C ports with Thunderbolt 3 support. 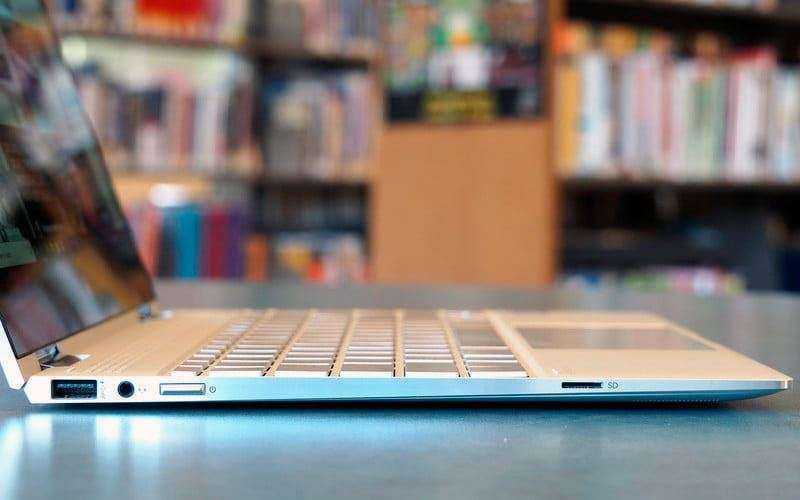 Any of the two USB Type-C is supposed to be used to charge the laptop from the outlet, and to the second one to connect all kinds of peripherals. 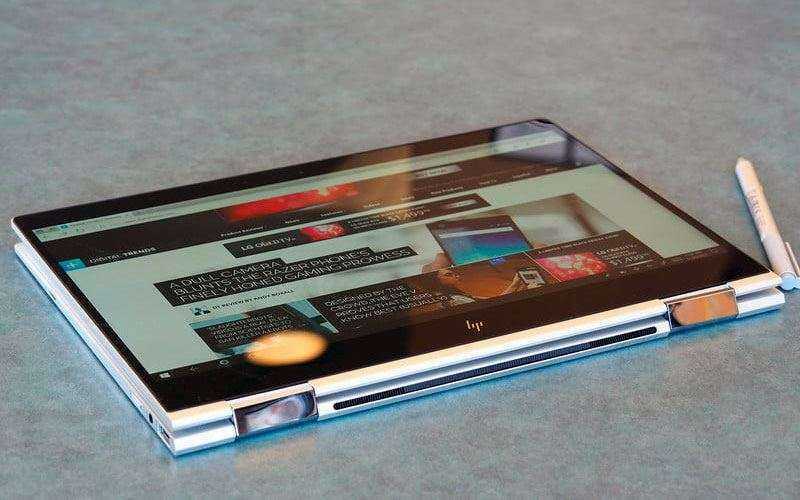 HP also added a 3.5mm audio jack and a microSD card reader, which was not available in the previous model. The new x360 13 is also equipped with a wireless connection 2 × 2 MU-MIMO Wi-Fi and Bluetooth 4.2. HP Specter x360 13 (2017) is equipped with the latest4-core Intel Core i7-8550U processor. In the Geekbench4 test, the x360 13 that I surveyed scored 4882 points in single-core and 14 135 in multi-core mode. This is comparable to the very fast Yoga 920 - 4683 and 14,566 points, respectively. In the more demanding Handbrake test, whichEncoded 420-MB video in H.265 format, the last Specter x360 13 completed the process in 723 seconds. But, Yoga 920 was faster - 613 seconds, while the previous generation Specter x360 with Core i7-7500U took 1095. HP also introduced a new updated x360 13a cooling system that uses an infrared sensor to measure chassis temperature and modulate fans. During the test, the hull never got hot. HP installed SSD Lite-On CA1 PCIeSSD on the HP Specter x360 13 (2017) I tested. Solid State Drive is fast. In the test Crystal Disk Mark, he showed the result of 1 769 MB / s in writing and 998 MB / s when reading. This is a good indicator compared to Yoga 920 - 1 172 MB / s and 1 147 MB ​​/ s, respectively. The previous generation Specter x360 used a slower SSD that showed 1,202 MB / s and 583 MB / s, so we have a decent update in this regard. 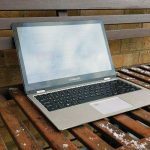 In real use, the Specter x360 13 SSD worked well: the device loaded quickly, opened applications and files without delay, and easily performed all the tasks. Eighth-generation Intel processors provideSome real increase in HP Specter x360 13 (2017) performance, but not for gaming. The integrated graphics card Intel UHD 620 received a change only in the name, and its capabilities remained the same. Specter x360 13 end of 2017 in the tests 3DMark is at a higher level compared to any other machine using a similar graphics processor. I tested the Civilization VI on medium andultra high settings. The new Specter x360 13 has reached 12 FPS and 7 FPS in the game, respectively. 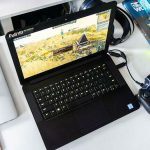 For more serious products, you have to buy a more powerful laptop, or Surface Book 2, which is the best (and most expensive) 2-in-1 gaming option. Full HD display combined with effectiveThe eighth-generation processor and a relatively large battery is the best choice for those who want high-quality video viewing and better battery life. In the most aggressive test of the battery (testBasemark) my Specter x360 13 worked 4 hours 14 minutes, which exceeds the results of Yoga 920 with 3 and 23 minutes. 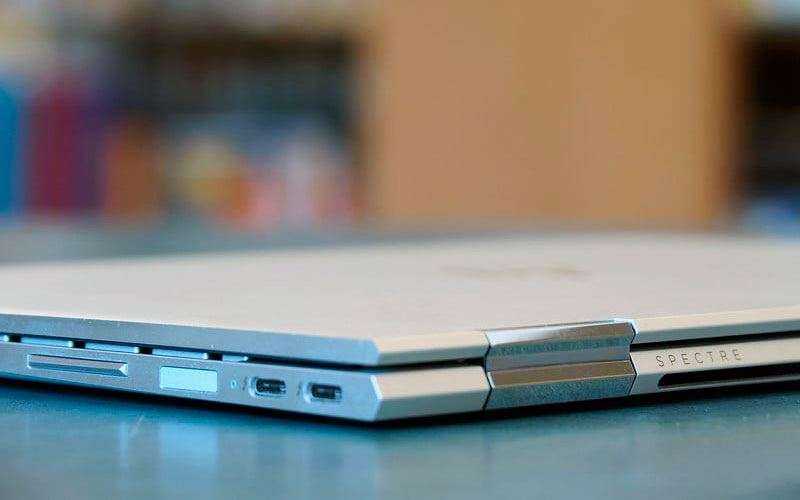 But, EliteBook x360 G2 with Core i7-7600U lasted 4 hours and 48 minutes. 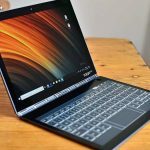 When browsing the web x360 13 (2017)lasted 8 hours and 25 minutes, which almost corresponds to the EliteBook x360 G2, but lagged behind the previous Specter model from 13 and 18 minutes. As you can see, the Core i7 processor of the eighth generation begins to demonstrate its effectiveness while reducing the processor load. The last Specter x360 13 performed well invideo playback test. 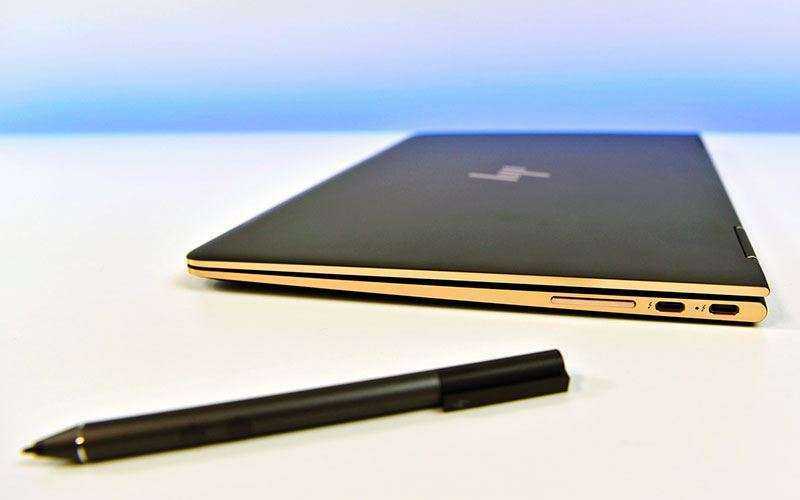 Here, HP worked for 14 hours and 18 minutes, bypassing the Yoga 920 and competitors. Of all the machines tested, only Lenovo ThinkPad X1 Carbon (14 hours 30 minutes) and Surface Book 2 (more than 20 hours 30 minutes) worked longer. In any case, the new x360 13 with moderate use will work for more than eight hours without additional charge. 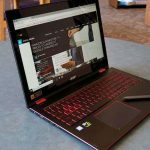 Reviewed by me HP Specter x360 13 (2017)worked on Windows 10, to which some programs have been added: a trial version of McAfee and Dropbox (with the latter we will receive free 30 GB of space for a year if we create an account). The rest of the software is what is in every Windows 10 system. 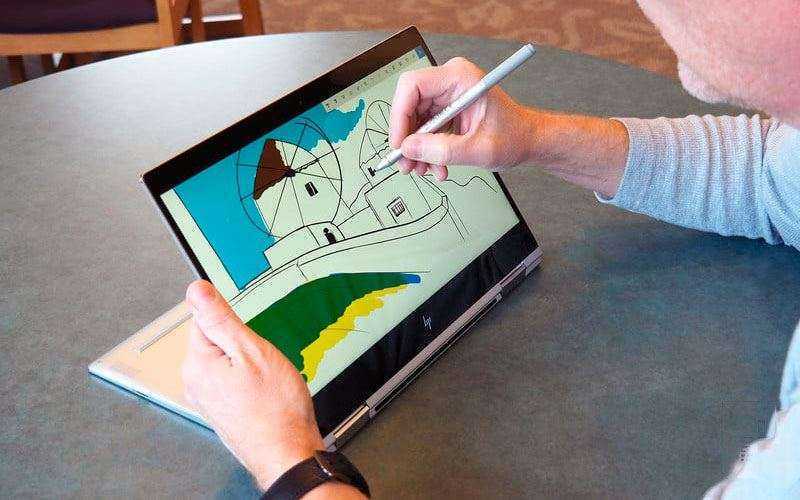 HP offers the latest Specter x360 13 with a standard one-year warranty. 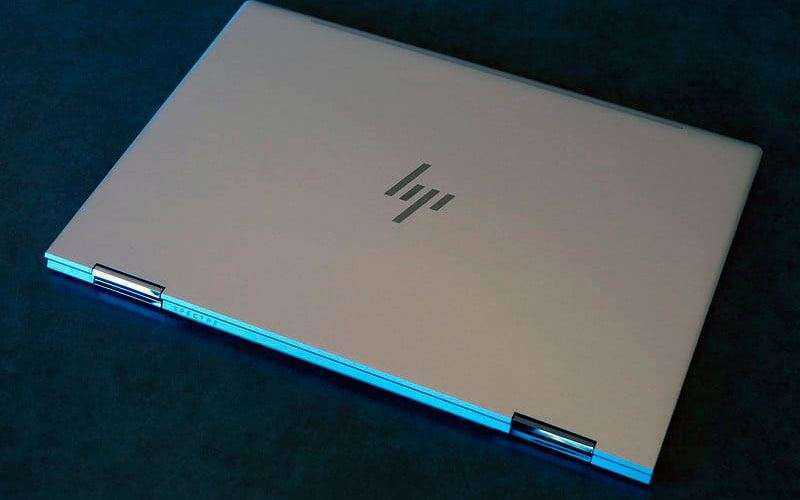 Is there an alternative to the HP Specter x360 13 2017? 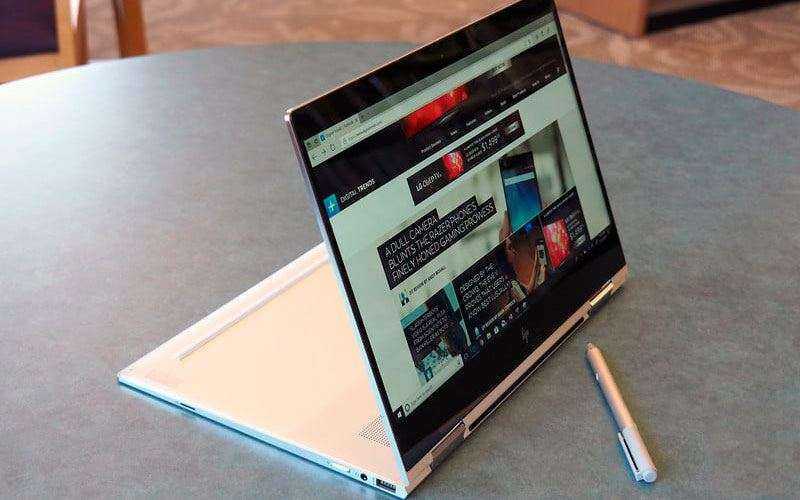 Transformer Specter x360 13 2017 year you canCompare with the Yoga 720 13, which offers the same 13.3-inch display in Full HD or 4K UHD, with a more powerful processor of the eighth generation. But, it does not have the same lightweight design and battery life, as the new x360. Another good option is the Lenovo Yoga 920 13.9 with an updated design and the most durable case among 2-in-1 devices. Its price is $ 1,330 ($ 75,000) in the base case. 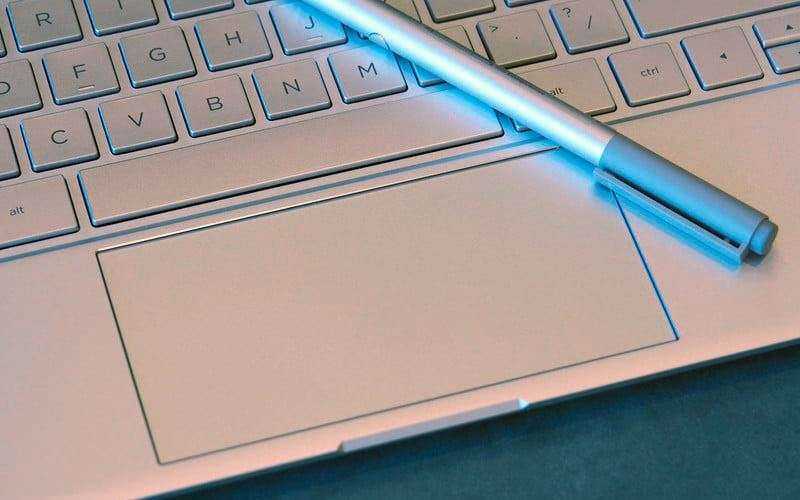 Microsoft Surface Book 2 13 will be the bestChoosing if you plan to use 2-in-1 longer as a tablet, but it also has a higher price of $ 1500 ($ 84,000). Surface Book 2 comes with a Core i7 processor, Nvidia GTX 1050 graphics chip, 4K display and incredible battery life. The new HP Specter x360 13 (2017) is awesomelaptop transformer, which will be an excellent device for work. It provides fast operation, long battery life, and a durable and versatile folding design. 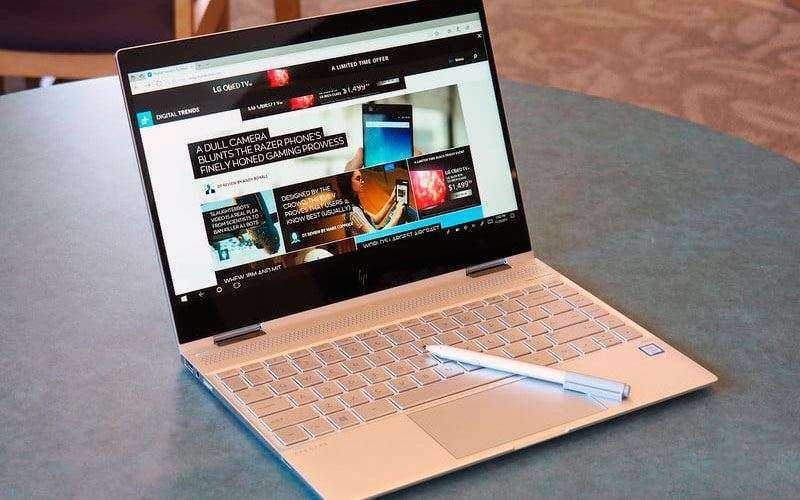 Add to all this the improved stylus, the excellent keyboard, the flexibility of Windows 10 Hello and the HP 2-in-1 transformer will take their place as a favorite laptop, which can also be a tablet. Full HD display from the previous model. Low sensitivity of the stylus.